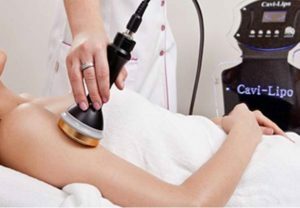 Cavi-lipo treatment, or cavitation is an FDA approved fat reduction procedure that is not only non-surgical but it is also a non-invasive fat reduction treatment that offers NO downtime. Imagine being able to go for a liposuction treatment and going right back to work after? With Cavi-lipo treatment, we use low-frequency ultrasound waves to create bubbles in fat cells inside your body. Since the structural integrity of these fat cells cannot withstand the vibrations produced by the ultrasound machine, they gradually grown and implode once they reach a certain size. This leads to instant fat loss. The best thing about Cavi-lipo treatment is that it does not negatively affect the nervous, vascular or muscular tissue. It is a fat reduction treatment that is suitable for most people (it is advisable to consult with your doctor first). It is a painless procedure that is rather pleasant as it is comparable to getting a warm massage. Which parts of the body can you get Cavi-lipo done on? There are really no real limitations to where you can get Cavi-lipo treatments done on your body. What do I need to do to get the most out of my Cavi-lipo treatments? 1) Drink at least one gallon of water. Water is a very important part of the procedure. You should strive to drink no less than 1.5 liters of water every day before, during and after the treatments. Drinking lots of water ensures that maximum removal of the broken down fat cells as well as toxins from your body. Your body does not like sudden changes or abrupt rigorous exercise regimens. You should introduce all these healthy changes slowly and gradually. Instead of going on a crush diet which will probably lead to injury and the body hoarding the fat thinking that you are starving, the best way to go about it is to slowly start eating smaller and healthier portions of each meal. Not only does this provide your body with the energy it needs but it also gives it time to adjust to your new dietary regimen. You need to make your body resort to using the already existing stores of fat as energy. As such, you should avoid eating heavy carbs such as pasta, bread, rice etc. Your diet should aim for a calorie intake of about 300 to 500 per day and this should be done gradually so you can start feeling the positive effects of eating less and having your body work with you for natural weight loss. 4) Empty stomach for at least 4 hours before going to bed. One of the main reasons why we are told not to go for that second helping during dinner is because all that food does not get put to get use when you are asleep. Instead of burning off those calories, your body will digest and store them as fat when you are sleeping. That is why you should empty your stomach at least four hours before going to bed. It gives your body a chance to turn to the stored fat for energy. Exercise is absolutely crucial if you want to keep the fat off after the Cavi-lipo procedure. As we already mentioned, you should start with light exercises such as short walks and maybe a mild jog, swimming and so on. This helps you maintain your weight within a healthy limit during and after the procedure. Make sure that there is some form of physical activity in your daily routine. Our spa uses the latest machine for Cavi Lipo treatment that provides the best results. If you want to get that dream body that is not only shapely but fat free, then schedule your free consultation today and let’s get you started on your journey towards physical perfection.